With three matches to go, the dreaded peg 20 is still waiting for me and I had a horrible feeling I would be on it today. 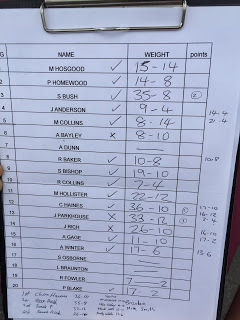 As Blaker won the last match he got to chose the envelope for todays draw sequence and as Les read out the pegs, my home for today was peg 14 which I was happy with. The sequence put Blaker in peg 20 and I really needed to gain some points on him today. As I took my kit to the peg, quite a few carp could be seen moving about and I fancied I’d get a few shallow today. I set up the usual shallow rig, five metre meat rig (which I’m yet to get a bite on!) and a dibber for down the edge, all rigs had 0.14mm hooklengths and size 16 B911’s (either spade ends or eyed with a hair rigged band). On my bait tray I had 6mm and 8mm pellets plus some 6mm meat which I’d added a couple of squirts of Bait-Tech Krill and Tuna liquid. After a quick chat with Jamie Parkhouse, Les blew for the start at 10:30. 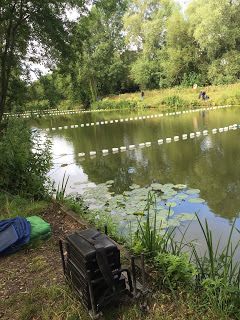 I had a big bed of lilies to my left and my inside line was on the other side of these at about six metres and I cupped in half a pot of meat and pellets here before starting shallow at 11.5 metres. With all the carp milling about I felt confident that the pole would wrenched round at any minute, Jamie P had a couple of early carp on his depth rig and Bish over on peg 9 opened his account fairly quickly too. I hadn’t had any action after 30 minutes but I wasn’t too worried yet as it’s never a fish race here and normally two fish an hour will put you there or thereabouts. After an hour I was still blanking and although not exactly panicking, I was starting to get a little concerned. Jamie P and Bish both now had around four carp and Butch in peg 8 and Shane (fishing for Andy Bayley) in peg 6 had a couple of carp each and Janders had landed one too. After a further half an hour with nothing to show for it, I had to try something else, I fed some more meat and pellets on the inside before trying the five metre meat line, I must admit to having no confidence with this line as I haven’t had a bite on it yet in the previous seven matches (admittedly I haven’t spent that long on it!) so was amazed when after five minutes the float sailed away, so amazed in fact that I missed it! I missed another bite a few minutes later but it could have been small fish. I tried this rig on my longer line where it was the same depth and had a few knocks (small fish?) but after two hours the only thing in my nets was water! Jamie P and Bish hadn’t added anymore and despite there being loads of carp cruising about, they just weren’t interested and most people were now struggling. I slipped on a cube of meat and tried the inside line for the first time, I had a couple of indications quite quickly but I think they were liners, then the float slid away and I finally connected with a fish, it was a good one too and I was mightily relieved when I slipped the net under a 6-7lb common. I had two more carp quite quickly to put me on about 12lb but then I couldn’t get a bite again. I had another go shallow and tried chasing fish around but they just didn’t want to know, I did have one bite but as soon as I struck I knew I’d foulhooked a fish and it wasn’t on long. 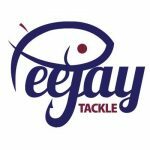 I had another go on the five metre line and the float sailed away and there was no missing that bite, it wasn’t a big fish , probably 3lb or so and it was pretty much under control when all of sudden it came off and when I checked the rig, the hooklength loop had come undone! I was really mad with myself for such a schoolboy error and I really could have done with that fish, especially as both Bish and Jamie P had added a couple more to pull away again. By all accounts Hainsey was catching in peg 12, and it looked like Andy Winter on peg 16 and Bushy on peg 3 were getting a few now as well. Time was running out and I was still stuck on three fish and had resigned myself to a bad day, worse still, if Blaker had managed to sneak a few out in peg 20, any chance of the league would be over too. I was back on the inside line and with an hour to go I’ve had my fourth carp and then ten minutes later I’ve hooked another, this fish tore off and with the pole tip under the water it still wasn’t slowing down, I kept thinking I should add more sections but didn’t and of course the hook pulled out (schoolboy error number two). With about 15 minutes left, I looked up to see Janders playing another fish and thought I might be paying out some side bets today when the pole was wrenched round as a big fish took off, after the initial run, the fish just wallowed and I managed to net another decent carp, this one a mirror around 6lb or so. There were still a few minutes left but that was the last of the action. Jamie P said he’d ended up with ten carp and Hainsey had nine and the Hoff had six or seven so I didn’t think I’d be scoring very many points today as I thought I might have 18-20lb. 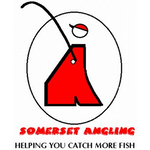 I packed up and took my kit back to the car before catching up with the scales which had already weighed Exeter Mike in peg 1 who’d had 15lb 14oz and Paul H who had 14lb 8oz in peg 2. Bushy then went into the lead with 35lb 8oz and had caught most of his fish late. Janders had 9lb 4oz and had lost quite a few fish in the lilies, Mike Collins had 8lb 14oz next door and Shane had 8lb 10oz from peg 6. Butch had 10lb 8oz from peg 8 and then Bish had eight carp for 19lb 10oz, Rich Collins had 7lb 4oz from peg 10 and then the Hoff had seven carp for 22lb 12oz from peg 11 and I started to think those two fish I’d stupidly lost were going to cost me. Hainsey then just edged into the lead with 36lb 10oz from peg 12 before Jamie P weighed 33lb 12oz to go into third place. Then it was my turn and my five carp weighed 26lb 10oz which actually put me in fourth place for the time being. Picky had 11lb 10oz and Andy Winter had 17lb 6oz, Oz and Les didn’t weigh, Rocking had 7lb 2oz and then we got to Blaker, he’d had four carp and weighed 17lb 2oz, so I finished fourth, picked up £40 plus three out of four side bets (I lost one to Jamie P) and gained a few points on Blaker. So all in all, a pretty good day, admittedly I possibly could have won it if I hadn’t lost those fish but considering I was blanking after two and a half hours, I’m happy with the result. 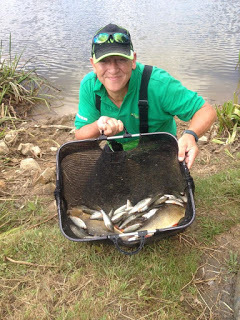 In other news, Dillington pond continues to fish really well and Stuart Alford won todays match with an excellent 36lb 12oz of bream and skimmers on the feeder from peg 6. 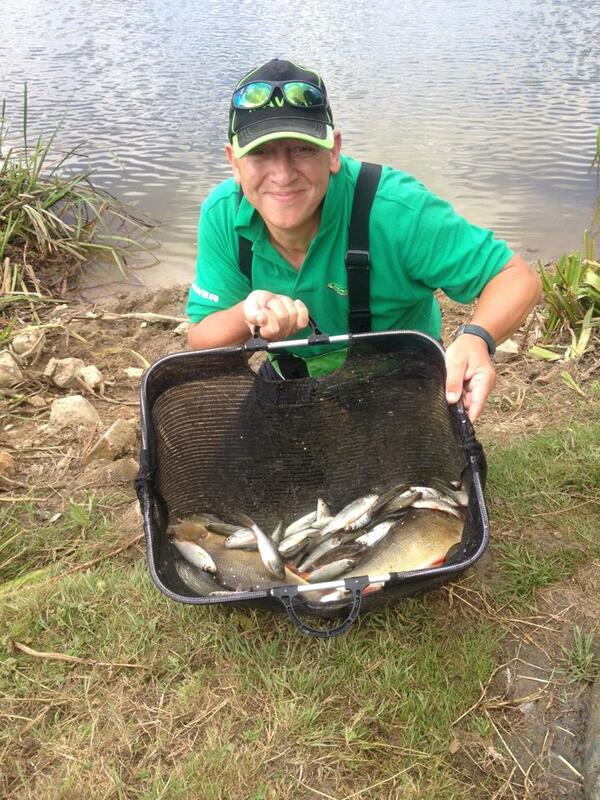 Good back up weights followed and Graham Field included two cracking perch in his second placed 24lb 4oz from peg 20.